This is my re-working of Henry Hazlitt’s book, Economics in One Lesson (1946). He was a friend of mine. It was late in his career, and it was early in mine. He was always upbeat. He was always learning. I like to think that he would have approved of my book. It targets an audience very different from his: Christians who are interested in both economics and ethics. His audience initially was initially readers of hisNew York Times column. But that did not work out. Before the year ended, Hazlitt left the New York Times because of his opposition to the 1944 Bretton Woods agreement, which created the International Monetary Fund and the World Bank. The IMF went into operation in 1946. 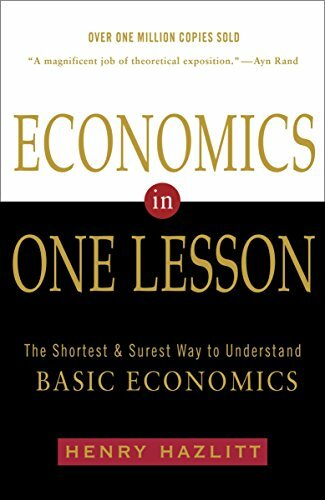 Economics in One Lesso... Henry Hazlitt Best Price: $4.32 Buy New $10.66 (as of 05:35 EDT - Details) We now know that the chief American negotiator at Bretton Woods, New Hampshire, Treasury economist Harry Dexter White, was a spy for the Soviet Union. Ex-Communists under oath testified to this effect in 1948, but they were ridiculed. In 2013, the Council on Foreign Relations published an article on White’s subversion. It was accurately titled “Red White.” White’s alter ego for Great Britain was John Maynard Keynes. Hazlitt knew the entire operation was against liberty, and he said so. This cost him his job. But he immediately got another as Newsweek. He kept it for 20 years. My book is different from Hazlitt’s. Our economic analysis is the same, but I openly label as theft the two dozen government intrusions into the free market that Hazlitt identified. He did not deal with the ethics of these intrusions. This weakened the case against them. I begin with this principle: “Thou shalt not steal.” I supplement this with Jesus’ response to Satan, when Satan tempted Him to turn stones into bread to feed Himself. Jesus cited Deuteronomy. Then was Jesus led up of the Spirit into the wilderness to be tempted of the devil. And when he had fasted forty days and forty nights, he was afterward an hungred. And when the tempter came to him, he said, If thou be the Son of God, command that these stones be made bread. But he answered and said, It is written, Man shall not live by bread alone, but by every word that proceedeth out of the mouth of God (Matthew 4:1-4). Ludwig von Mises in 1948 identified the underlying impulse of Keynesianism as being the same as described here: stones into bread, meaning something for nothing through credit expansion. In that essay, Mises made an error of judgment. On the contrary, Keynesian beliefs are found in almost every nook and cranny of the modern world. That is why there is a market for my book. The Remnant still holds out. Here is my version of Hazitt’s book. The chapter titles and order are the same. Between now and mid-December, I plan to add a link to the end of each chapter. The link will lead to a page of online documentary materials. There were no footnotes in Hazlitt’s book. There is now 70 years of evidence to ratify the truth of his book.